It takes a while to acclimate to Rock the Kasbah’s sensibilities, but it’s ultimately a journey worth taking. There’s a certain pace, a certain tone and a certain comedic taste in Rock the Kasbah. In a way it’s a clash of those cinematic sensibilities; politics, religion and humor are uneasy companions. None of that’s really much of a surprise. This is, after all, a Barry Levinson movie. The director behind an impressive catalog of movies that includes Rain Man; Good Morning, Vietnam; The Natural; and Wag the Dog has taken on this nutty story about a washed-up music talent agent who seeks out a fresh start in Afghanistan. Going into Rock the Kasbah almost totally cold, with only a vague awareness of the premise and an appreciation of the cast, the story seems pretty well whacked. It revolves around Richie Lanz (Bill Murray, Ghostbusters) insinuating himself in the promotion of a female contestant - the first female contestant — on Afghan Star, the Afghan version of American Idol. It’s not until the very end, when a title card reveals the movie’s inspiration, that news stories from a few years ago finally come to the fore. There really is an Afghan Star and there really was a female contestant who rushed to the top of the contest amid death threats and all sorts of controversy in the highly conservative territory. Of course, reality didn’t involve a goofy, American and no doubt drug-addled manager like Richie, but that’s where the movie takes its piece of inspiration and runs with it. Richie’s a shyster. Down and out in Van Nuys, he tells tall tales of his glory days, working with acts like Madonna, Stevie Nicks, Eddie Money and Pink Floyd while romancing the novelist Danielle Steele. HIs current roster of talent — as limited as it is — is further constrained to performing only cover songs. His one true talent, Ronnie (Zooey Deschanel, Almost Famous), totally freaks out after being hauled out to Afghanistan for a USO tour. She quickly runs off to Dubai — with Richie’s passport and cash. Sure, Richie’s desperate, but it’s quite an abrupt setup. Richie and his sleazy tactics are introduced. Ronnie’s relationship with Richie is quickly established, then she’s performing in a dive bar where a total stranger (and a totally drunk one, at that) puts a bug in Richie’s ear about making riches while touring with the USO. In the next scenes, Richie and Ronnie head off to Kabul, with Richie first being schooled by his young daughter that there are no casbahs (or kasbahs, for that matter) in Afghanistan. Richie’s frame of reference comes by way of a rock song. After that rather jarring setup, the movie settles into its groove and writer Mitch Glazer (Scrooged) meanders the characters into a thoughtful conclusion. Along the way there are some golden moments. At the top of the list is Kate Hudson being introduced as Merci, swimming in a sparkly, shimmering outfit in an opulent little pool area. It’s a hot scene. A kooky scene, the kind of movie magic that captures a quirky place and time — a far off land. Consider the movie officially settled in at that point. Hudson’s never been better; she looks incredible and she’s returned to her non-annoying days of Almost Famous. As it turns our, Merci’s a high-priced call girl with some bizarre service offerings, but she’s game to assist Richie with his plan to elevate Salima Khan (Leeam Lubany) via Afghan Star. 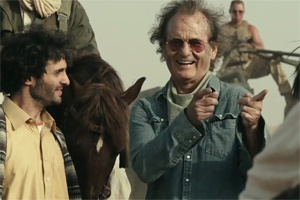 The story starts to hum along nicely, with Murray doing what he does best: being Bill Murray. He’s ultra-casual and ultra-cool. But by the end of it all, Richie displays a surprising amount of world awareness. He’s no longer stuck in the ‘70s and ‘80s. He abruptly becomes a little too savvy — particularly in regard to Afghanistan’s cultural and political leanings. Or maybe his hapless lifestyle buried that worldliness under piled-upon years of shallow living and the journey finally pulled him out of his own laziness. Richie may or may not have earned the benefit of the doubt, but at the least the movie makes for an interesting, thought-provoking ride into a different world.